Armed with a truckload of wings, tenders, apple juice and beer, I took to my living room for Super Bowl LI. Here’s what I loved, and hated, from the night. LOVE: Pregame show showcased the rich history of pro football in Houston, the Super Bowl’s host city. An excellent feature done by Wade Phillips, the L.A. Rams defensive coordinator. LOVE: Cooper Manning and Charissa Thompson doing the “red carpet” coverage of Super Bowl LI. Usually I’m not a fan of the whole red carpet at sporting events thing, but these two were pretty entertaining. LOVE: Jimmy Johnson wears a wig, I didn’t know that I needed this useful information. LOVE: Learning about Devon and Leah Still as they go to hospitals and visit sick children. It was quite heartwarming to see a girl that’s as young as Leah provide hope for children who are suffering with illnesses. Puts so much in perspective. HATE: Look, I’m not a fan of the musical performances during the pregame show. So sorry Fitz and the Tantrums, hated it. Zac Brown Band saved it with their song about fathers and sons. However, the music just seemed to be kind of thrown in there and I didn’t enjoy it. LOVE: John Glenn’s pregame feature was fantastic. It’s good to see the recently deceased American hero be honored and it featured a story that I had not known regarding his efforts to save the Cleveland Browns. LOVE: FOX made a bold approach in talking about the Colin Kaepernick protests and how players in the league were just more than taking a knee. A fantastic way to cover one of the leagues biggest storylines in the 2016-17 NFL season. HATE: The pregame interview with President Trump. It’s not that he was given the interview but my issue is that it was tape delayed. So we already knew what was coming from it, next time it should be done live. HATE: Tom Brady “love letters” Really? LOVE: The NFL took time to honor the legends and Hall of Famers who played at historically black colleges and universities. A tremendous honor and before the game. LOVE: Both quarterbacks taking shots, nobody really had the edge. Defenses did just enough to get the other team off the field. LOVE: Devonta Freeman with the first touchdown of Super Bowl LI (my pick for SB51 MVP). LOVE: The Tide commercial featuring Terry Bradshaw was hilarious. LOVE: We talk about huge plays, Atlanta breaks the game open with Robert Alford picking off Tom Brady and pulling a Jack Squirek in the Super Bowl (look it up kids) and all of the sudden the Falcons go up, 21-0. Oh My. LOVE: Lady Gaga’s halftime show was pretty solid. No special cameos or guests but we got a bunch of jumping off stuff. So that was neat. LOVE: The Patriots getting a stop on the first series of the half. Good on them, making a stand a trying to get back in the game. LOVE: Stranger Things and Budweiser commercials. Fantastic. LOVE: The Patriots finally finding the end zone for the first time in the ball game. Now they’re down 28-9. HATE: So we’re all in agreement that the Baywatch movie is going to be hot garbage right? Okay, moving on. LOVE: Grady Jarrett having the game of his life, three sacks to tie a Super Bowl record. Do you thing big fella. HATE: Matt Ryan, what are you doing throwing it on 3rd and 1. Come on man. And you fumble on top of it? SMH. 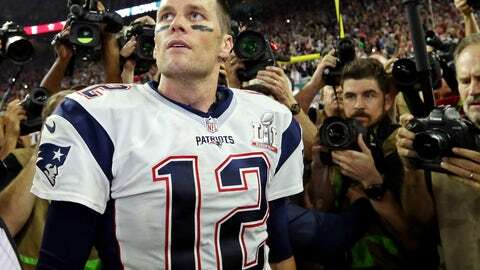 LOVE: Tom Brady put the superman cape on, 28-20 Atlanta. We’ve got a ballgame. HATE: Atlanta giving us a how to guide on how to blow the Super Bowl with some of this play calling. LOVE: We may be going to Overtime. Holy Crap. LOVE: One of the greatest comebacks in NFL history, complete. New England wins Super Bowl 51 34-28. LOVE: Roger Goodell. Tom Brady. On a stage together. We kinda needed to see this to happen after all we went through. This was one of the greatest games I’ve ever seen. The entire Super Bowl Sunday was great from start to finish. A few weak moments but all in all. A tremendous day.